LUCERNE, Switzerland — Wow. That was one heck of a day. Trains’ Swiss Tour 2018 visited Brienz, Switzerland, today for a ride to near the top of the Brienz Rothorn Mountain. 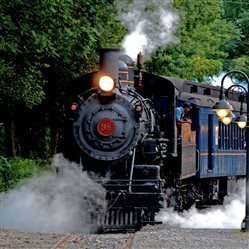 At the base is the small lake-side town with an 800-mm narrow-gauge rack railroad that uses mostly steam locomotives with diesel back-ups and diesel work trains. It was our ninth day of true summer-like temperatures — 75 to 85 degrees — blue skies, and gentle breezes. I think we were all excited about having a steam locomotive push all 36 of us up a mountain to the obligatory restaurant and quaint hotel overlooking nearby mountains. We departed the base on schedule at 9:40 a.m. for a nearly hour-long, five-mile ride to the top. We were unprepared for what started arriving to the top after us at about 11:45: a parade of three steam passenger trains. The Brienz rack railroad, you see, operates at least four steam locomotives and all of them operated today. The three trains we saw winding their way skyward were bringing the Noon-time lunch crowd to the top of the mountain in full sunshine where 36 railfans and significant others watched in full view. A small coal-burning tank engine built in 1891 powered the last of these ascending trains. Unlike it’s 1990s-built cousins, this last steam engine had a definitive thoaty chuff (or chug) and tossed up a healthy plume of sulfury smoke — oh how amazing it was. Breathtaking. Each of the locomotives’ stack blasts reverberated in successive staccato off the mountains’ walls and right up to us. The handful of us in position were even able to video or take pictures of the coal-powered train ascending the mountain into a tunnel in the foreground while one descending steam train exited another tunnel about a mile away and down the mountain. I make my living using words and I don’t have the right ones handy to adequately convey what we experienced today. The video above comes close. Tomorrow, we travel to the Pilatus Bahn for the world’s steeped cog railway. Can’t wait!